With all the work we've been doing on the bathroom, we are thrilled to finally be starting to look at tile. ***Cue marching band and parade. 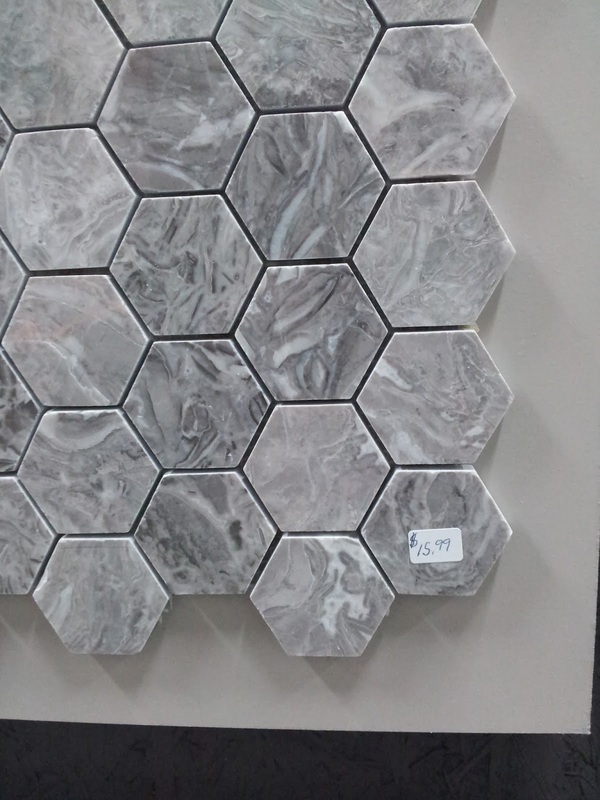 *** We are obviously very excited about this big step, so if you're not interested in joining us on a tile shopping journey, feel free to skip this post. 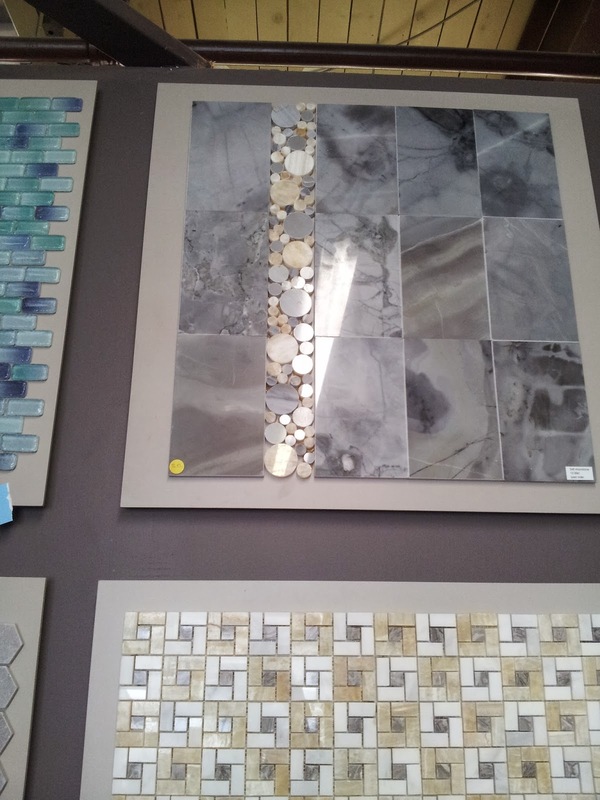 Choosing tile has surprised me because I honestly thought I'd be more decisive, the way I am with most other things. As it turns out, I am finding this decision so challenging because it is both expensive and difficult to change if I grow tired of it. I am also torn between wanting to choose something neutral for resale (occupational hazard) and wanting something that we really love and will be excited about. We're still not 100% sure but I'll take you through our process anyway. 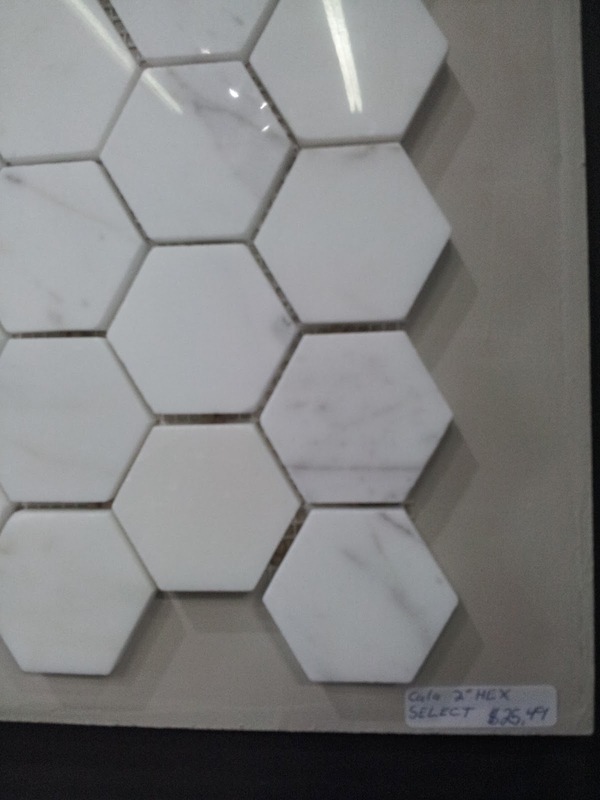 We began by looking at some geometric tiles. 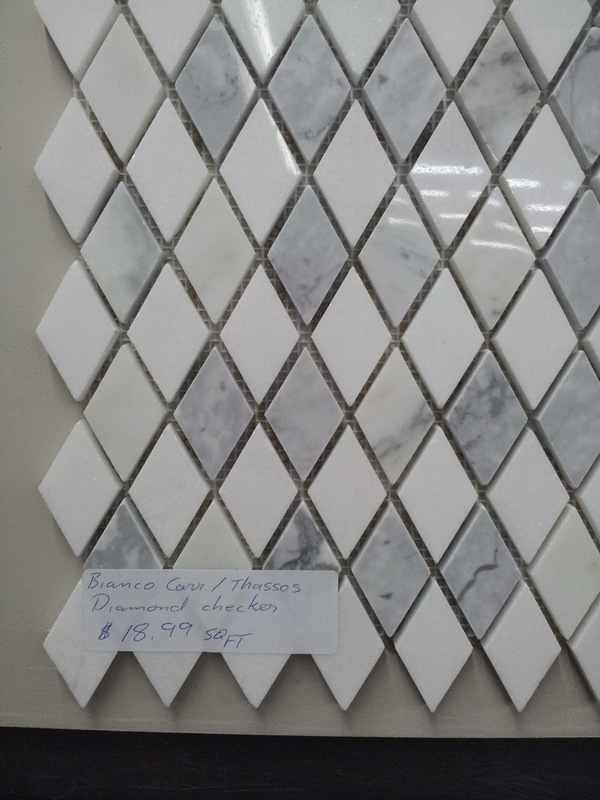 What do you think of these marble diamond tiles? 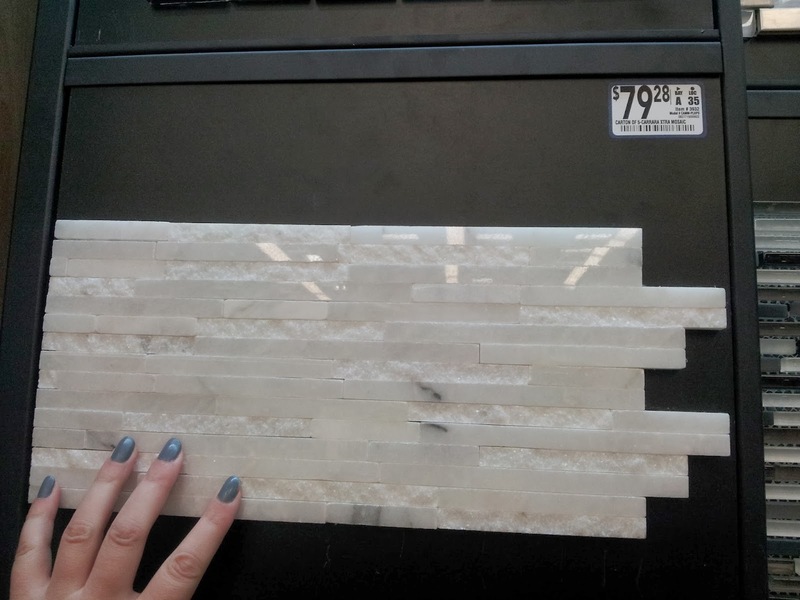 I'm not sure if I love the small marble tiles in general because I feel like you sort of lose the pattern in the marble. Still, they were so pretty that we just couldn't count them out! 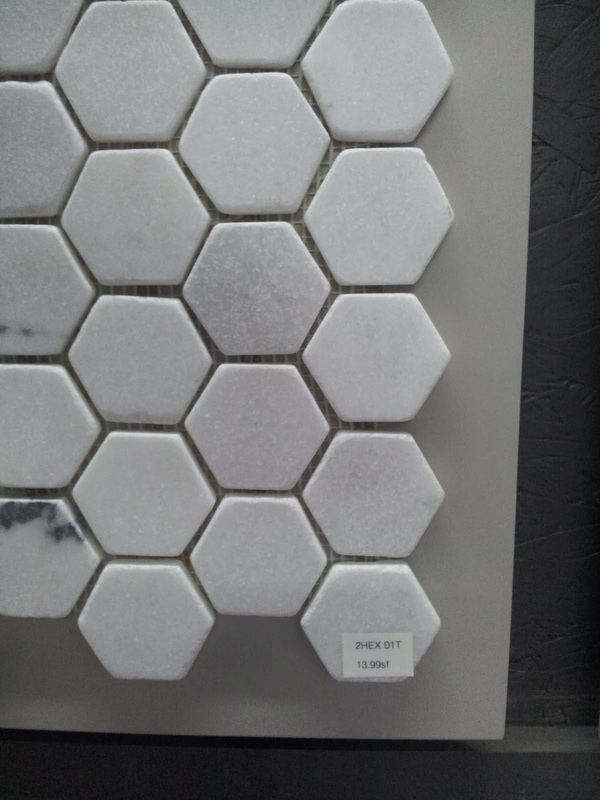 I don't know if I've mentioned it, but I'm a HUGE fan of hexagonal tiles! And penny tiles seem sort of retro and hip to me. I love the idea of choosing a tile like this as a nod to the age of our house. Also, if you are a fan of Cougar Town, (and a big dork, like us) you will find it nearly impossible to discuss penny tile without calling it "Penny Tiiiillllle!" And we're definitely the kind of people who would enjoy a hilarious tradition of shouting "Penny Tiiiilllle" each time we walk into the bathroom. 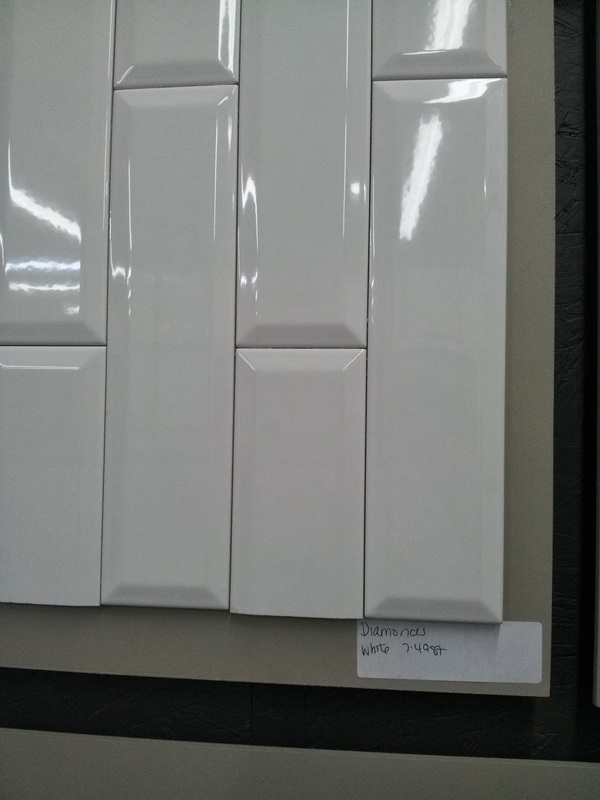 Subway tile is always chic and Corey just loved the bevelled edges on these. I thought this was a pretty accent. 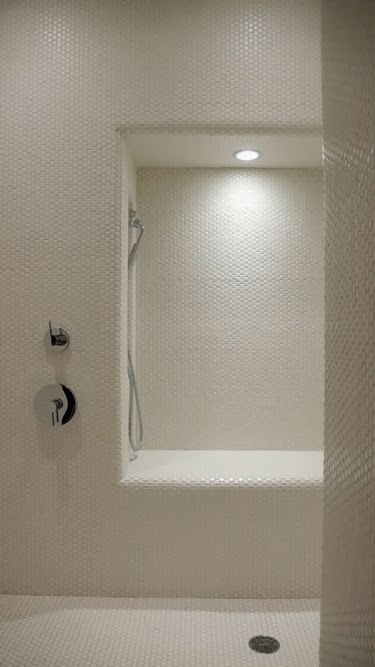 Do you like accent strips in shower surrounds, or do you think they're just a passing trend? 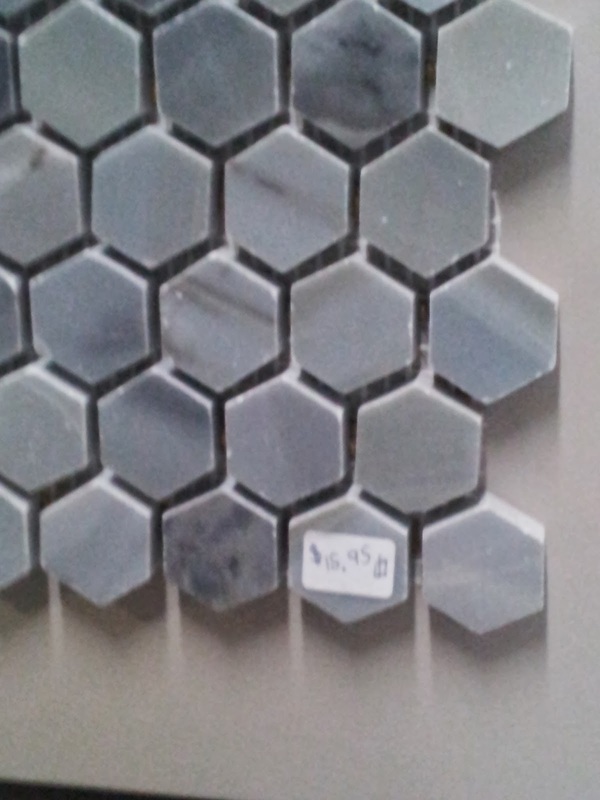 These mix-and-match hex tiles were about 7 inches wide. 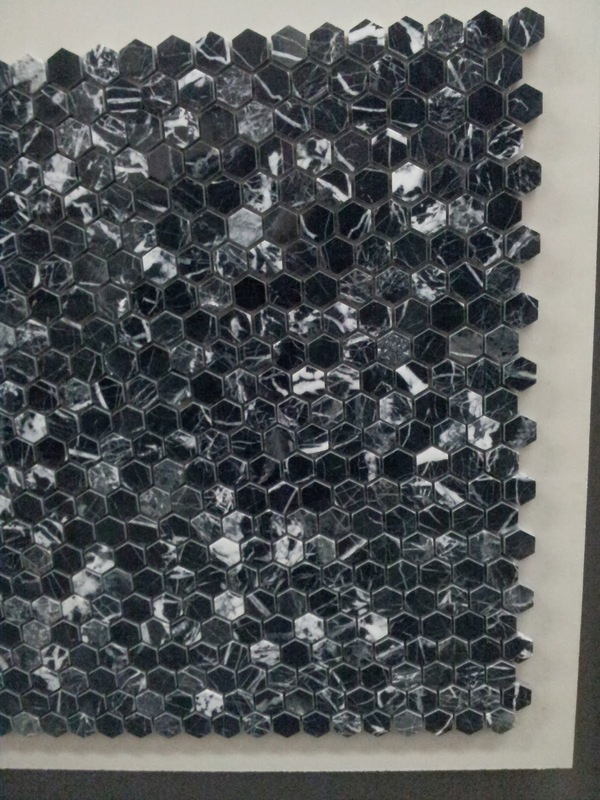 I love this pattern which mixes grey and black as well as glossy and matte. Do you love this? My only fear is that it may look dated eventually. I was obsessed with this pattern. I'm trying to find a way to use it as an accent somewhere. 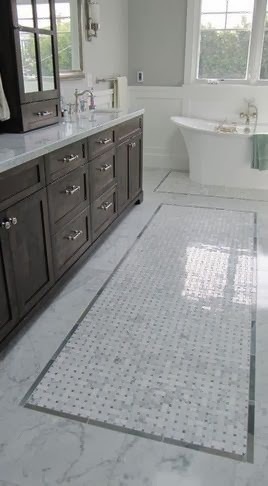 I love these clean, white tiles for the floor. 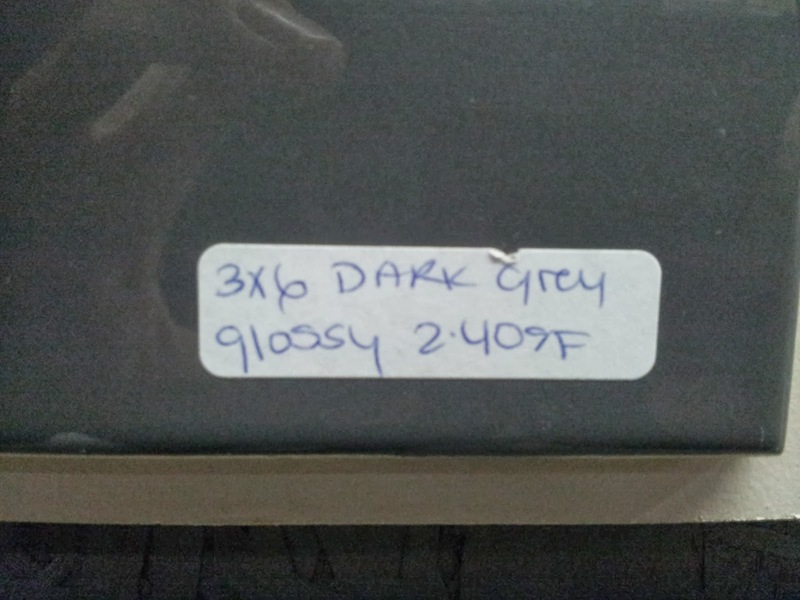 I'm a tad nervous about a large floor tile though... Just in case our clawfoot tub proves too heavy and causes cracking. 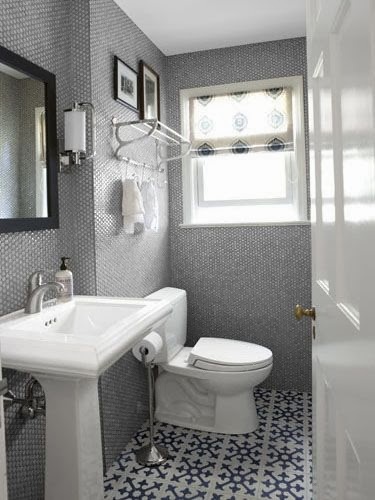 This houndstooth pattern is an interesting twist on the classic white subway tile. 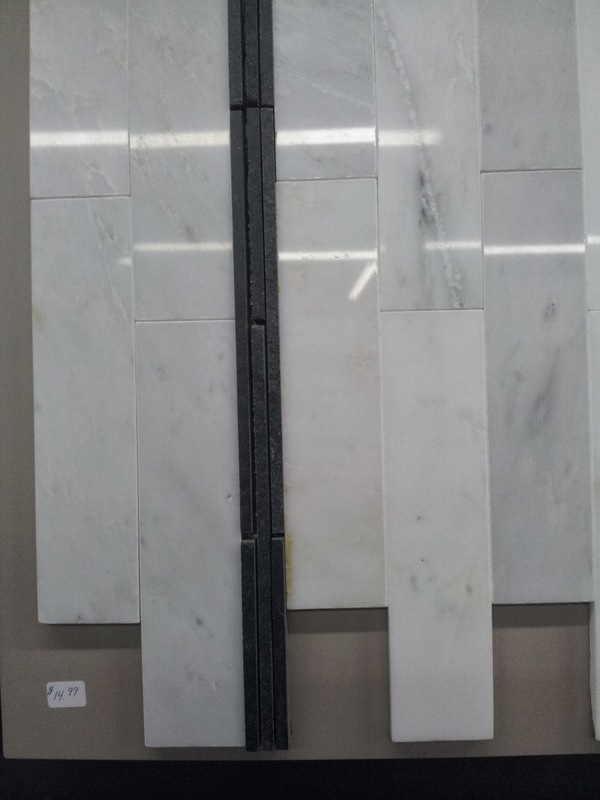 I also like the look of these marble subway tiles which are not offset here. I'm not crazy about the choice of accent but something else might look good. 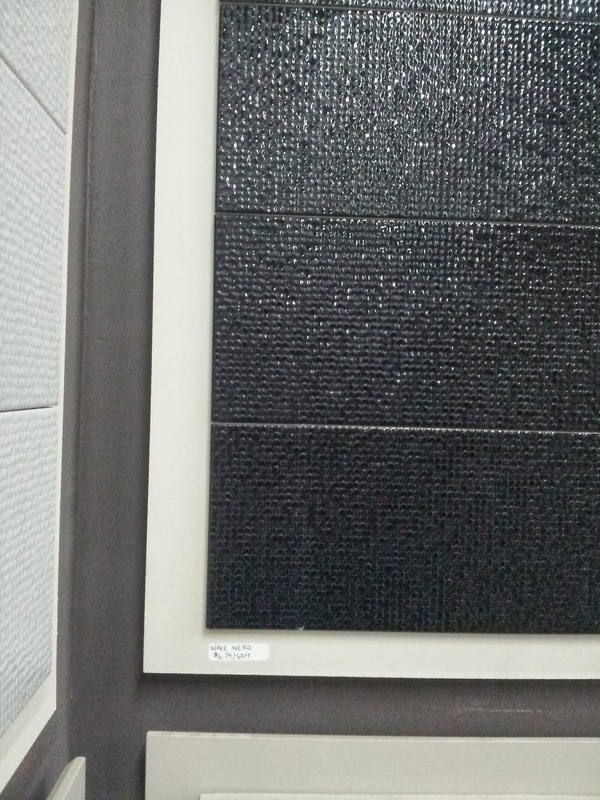 I couldn't decide how I felt about these ultra textured tiles... They seemed fun, but perhaps a little too much. 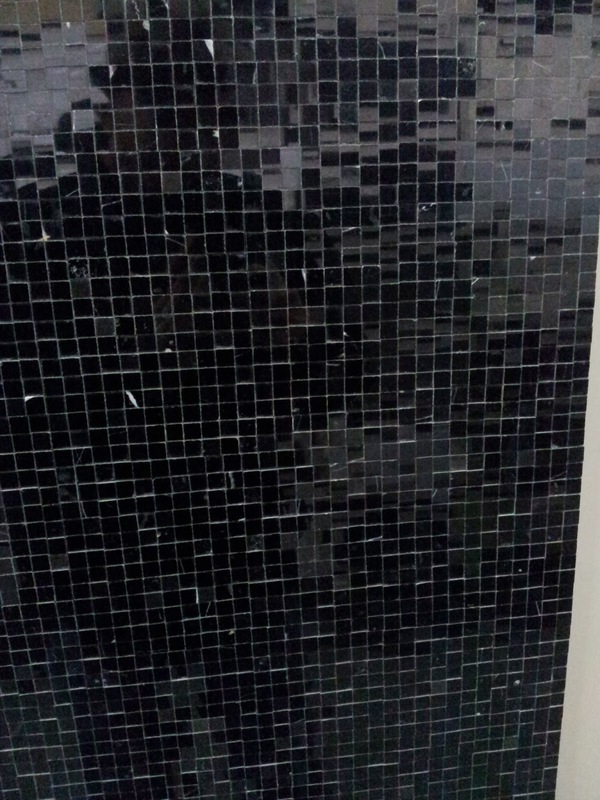 Remember those gorgeous black mosaic tiles that I want to use as an accent? 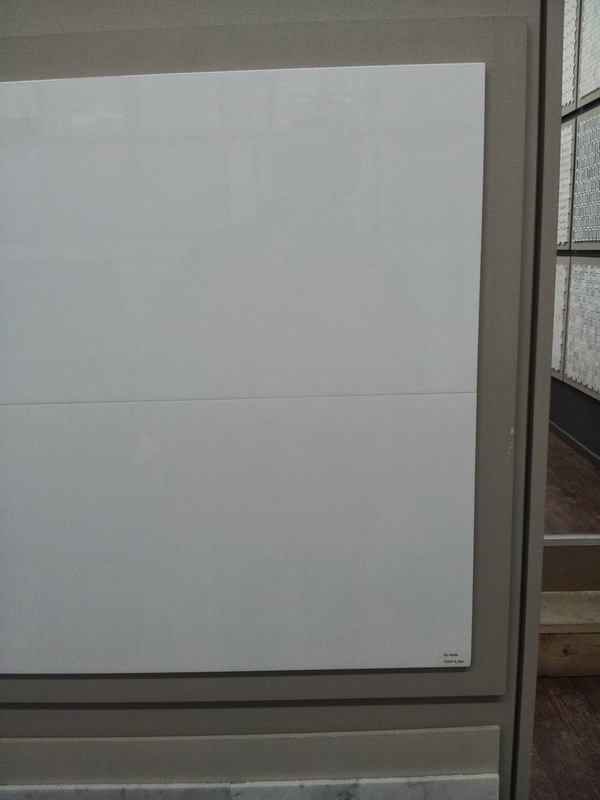 There's a white and grey version too... Could be nice if we decide to go with a white on white... on white theme. And then there's classic subway tile. Perfect and affordable in white or dark grey. On the way home, we stopped at Lowes just to compare their prices. 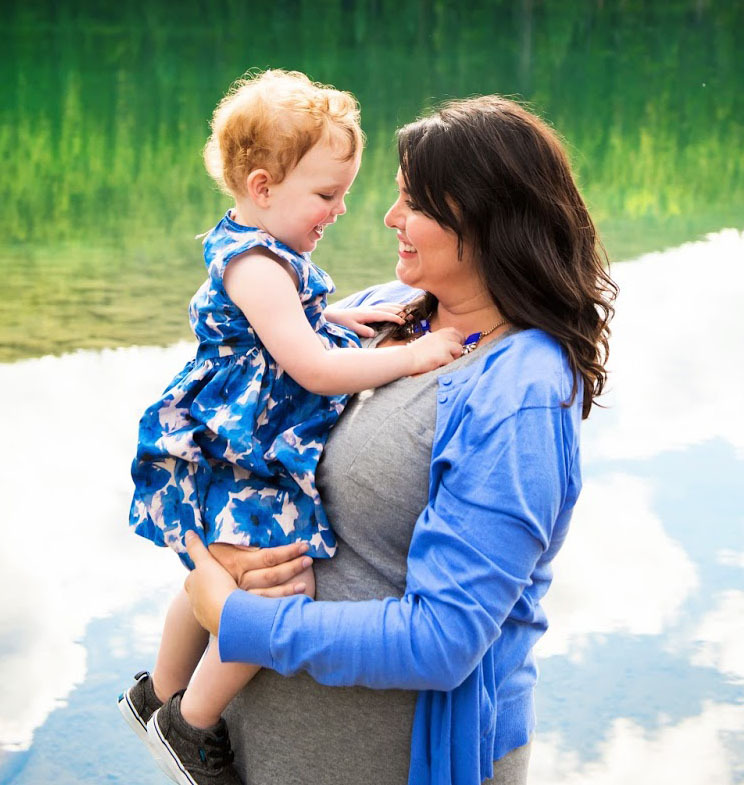 While their selection was pretty sparse, we found a couple of gems. 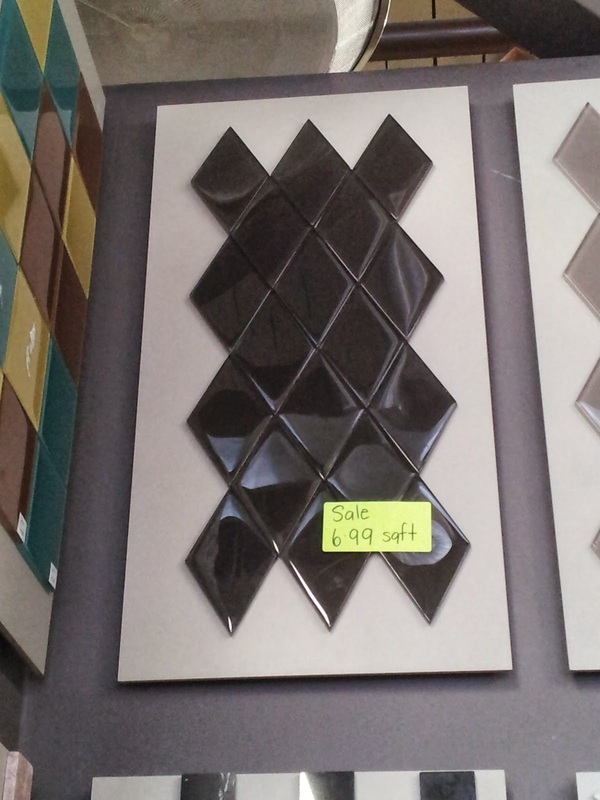 Or this (pricey) accent strip. Once we arrived home, we decided to check online for some inspiration. I'm going to apologize in advance for the lack of sources. Most of these were from Pinterest and not traceable to an original source. 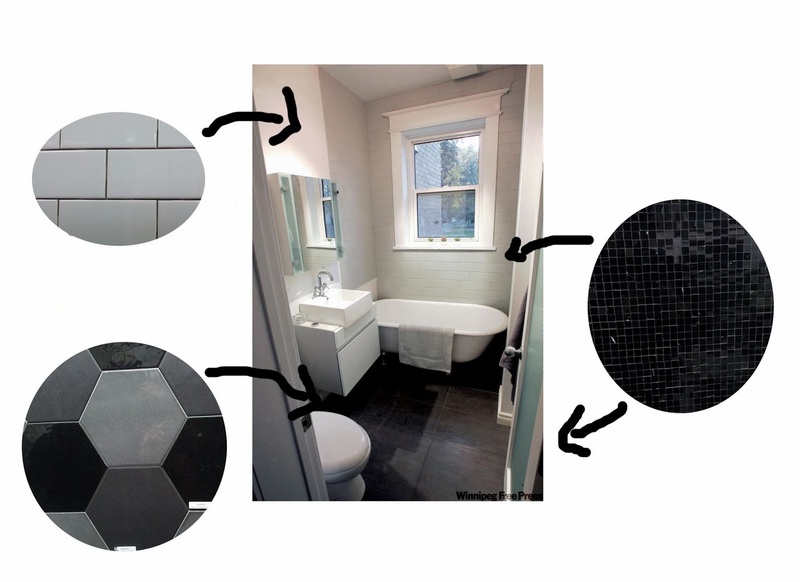 This first photo offers some guidelines on the logistics of exactly where to tile and where to accent. 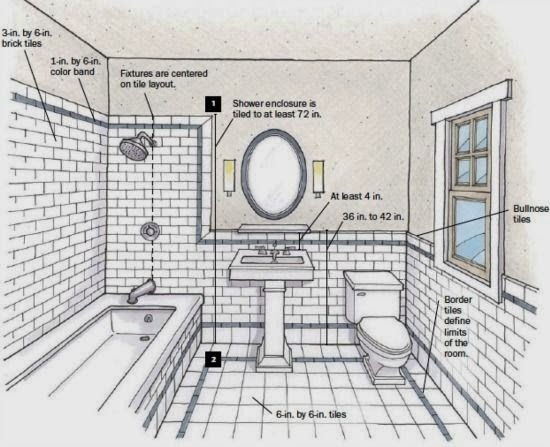 This bathroom is similar in size and layout to our own... almost a mirror image! 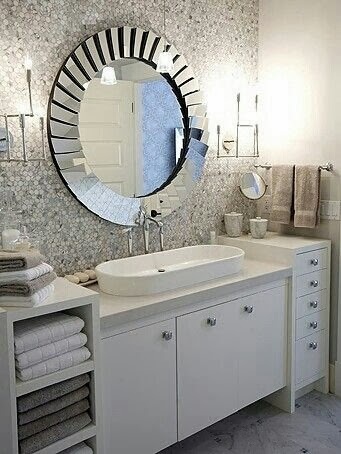 Even the white vanity looks like our Ikea model. 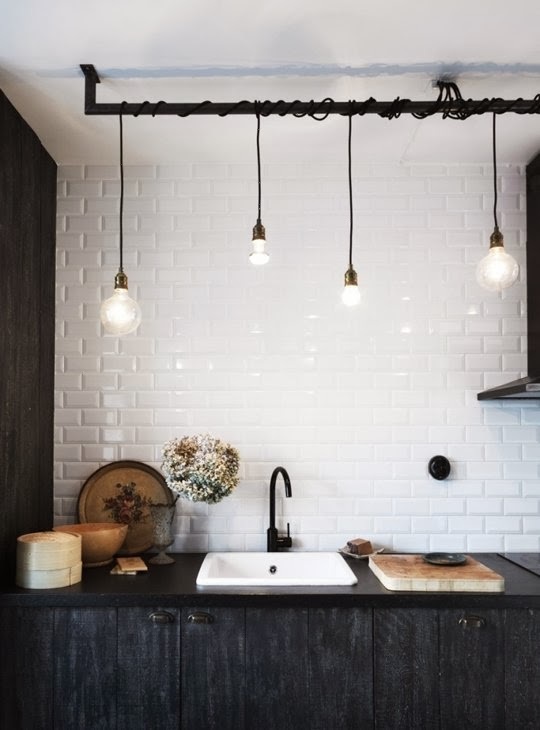 I love the use of the white subway tile and dark grout. What do you think of the dark floors? I've always heard that dark floors and light walls are visually pleasing because our minds expect the visual weight to be on the bottom. Do you think this is true? I thought this tile pattern on the floors was so interesting... almost like having a rug! 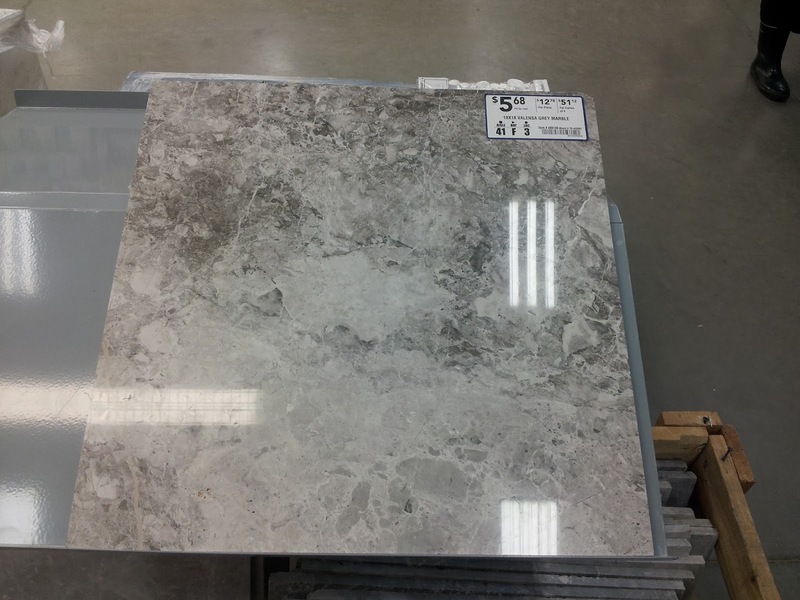 We're planning on installing a patch of heated floor and it might be cool to distinguish it with a different tile. 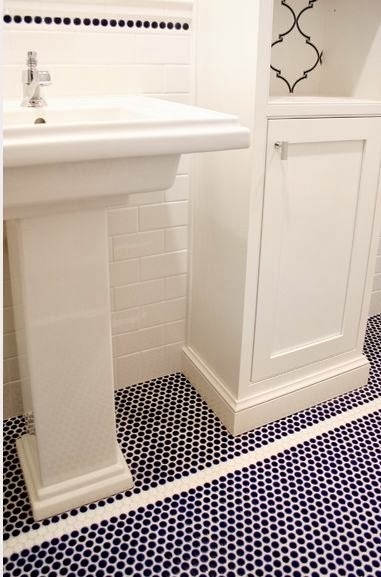 I love the grey penny tile here and the bevelled white subway tile is exactly what Corey likes. 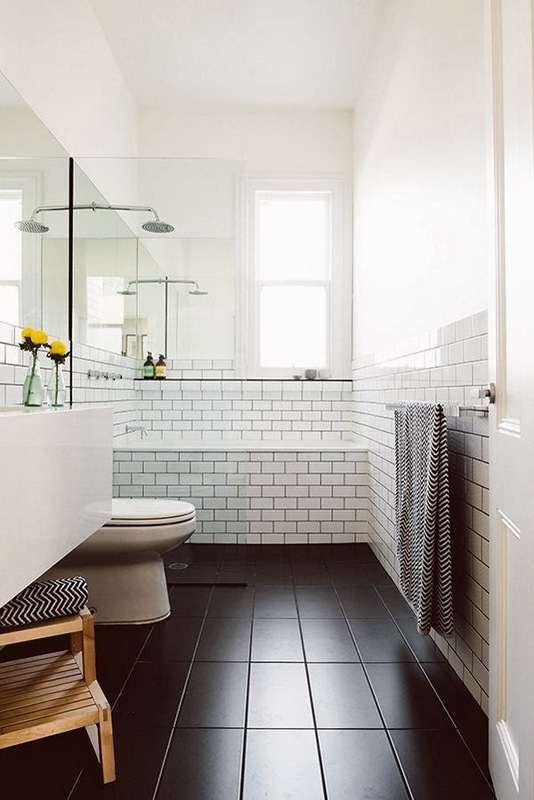 I'm personally not sure about the bevelled tile in such a small space because it add so much weight. I do love that chandelier over the tub though... Corey and I are already looking at chandeliers that are safety rated for wet or damp spaces. 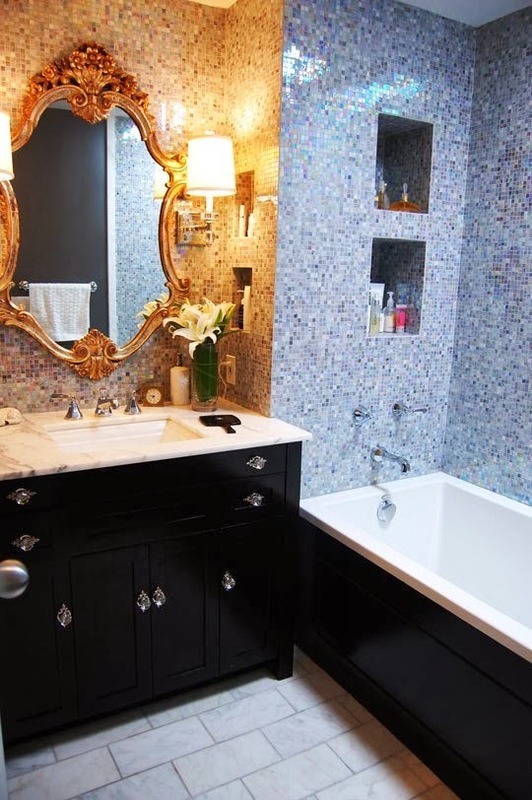 This one is an obvious N-O, but I wanted to show Corey a bathroom with floor to ceiling penny tile. Either way, I doubt we'll tile right up to the ceiling because we sort of doubt that the ceilings on our 88 year old house are level. 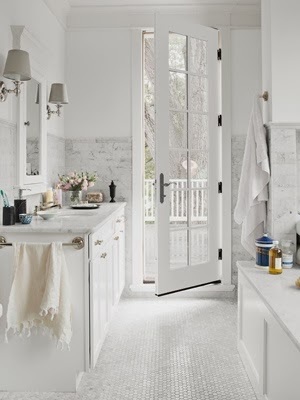 I just love the borders in this pretty bathroom. 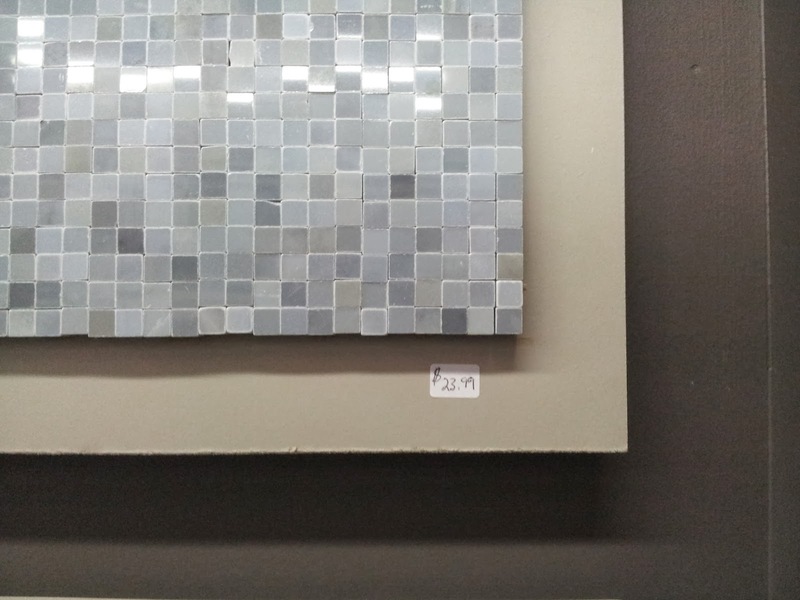 Those dark penny tiles also look great with white grout! This one is too crazy for Corey but I sort of love those mosaic floors. 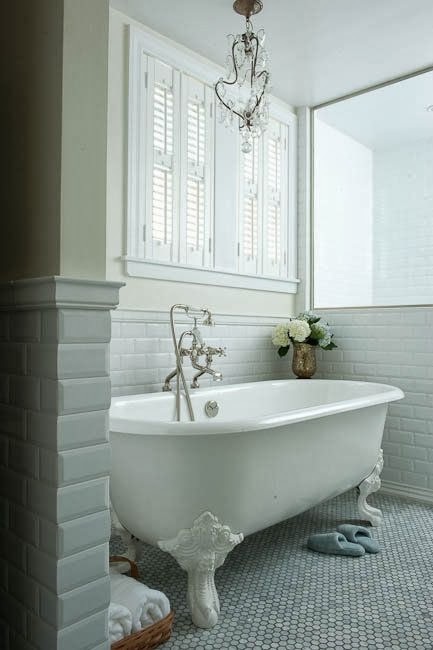 I love all the white with the marble grey subway tiles on the wall. Isn't this bathroom a breath of fresh air? 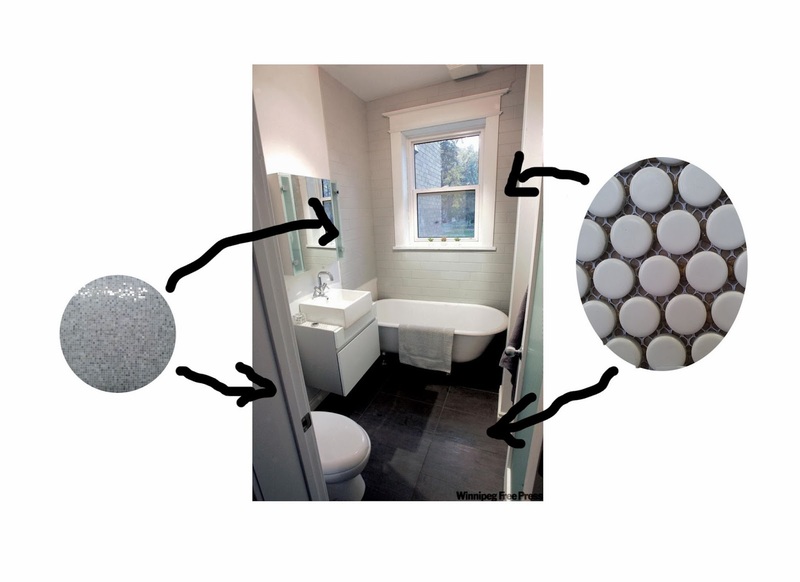 Again, probably too much, but this gives us an idea of how those grey marble floor tiles would work. 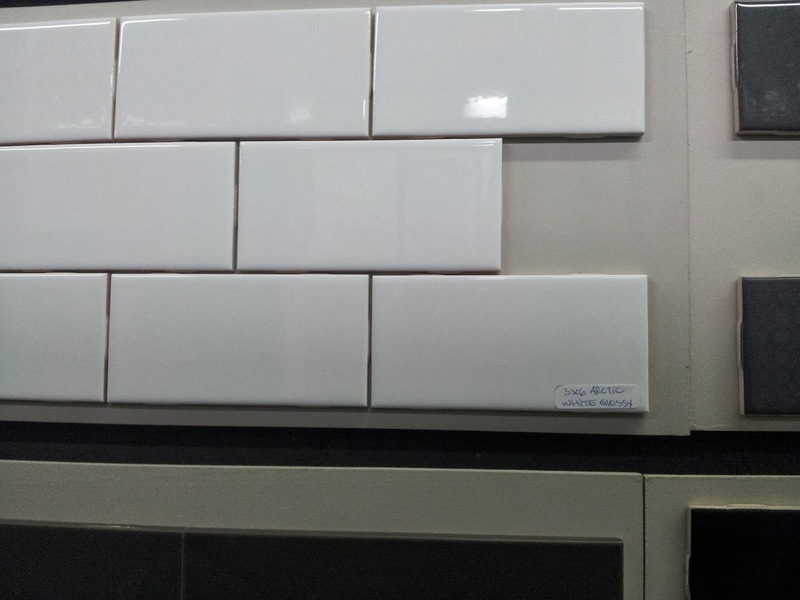 This is a kitchen, not a bathroom but I sort of love the white subway tiles with white grout. This is too busy for me but I do like the recessed shelving in the shower. 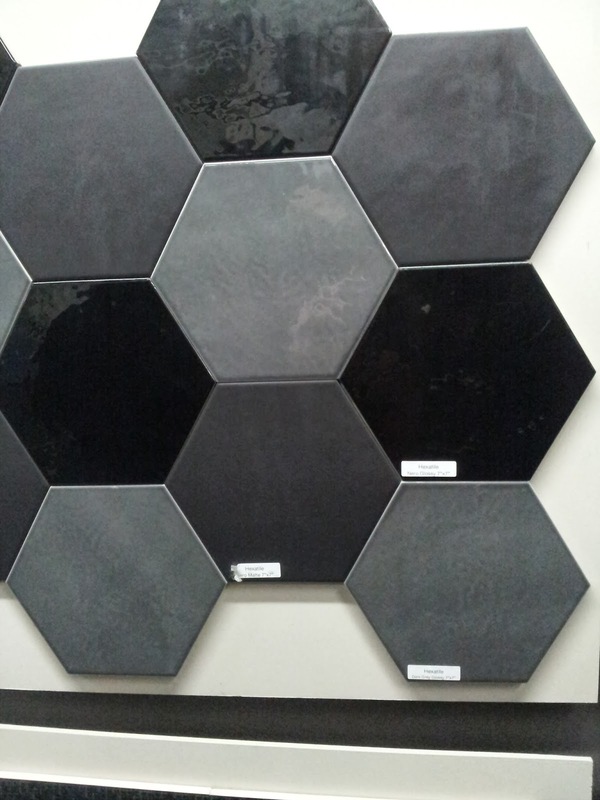 The hex floor tiles will work with the subway wall tiles and I do like the shiny black as an accent. 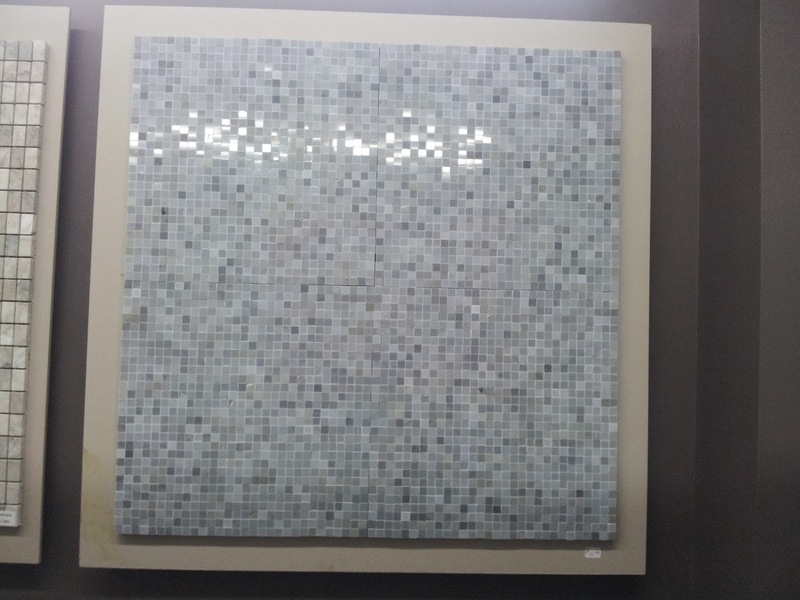 The shiny white mosaic was pretty as well. 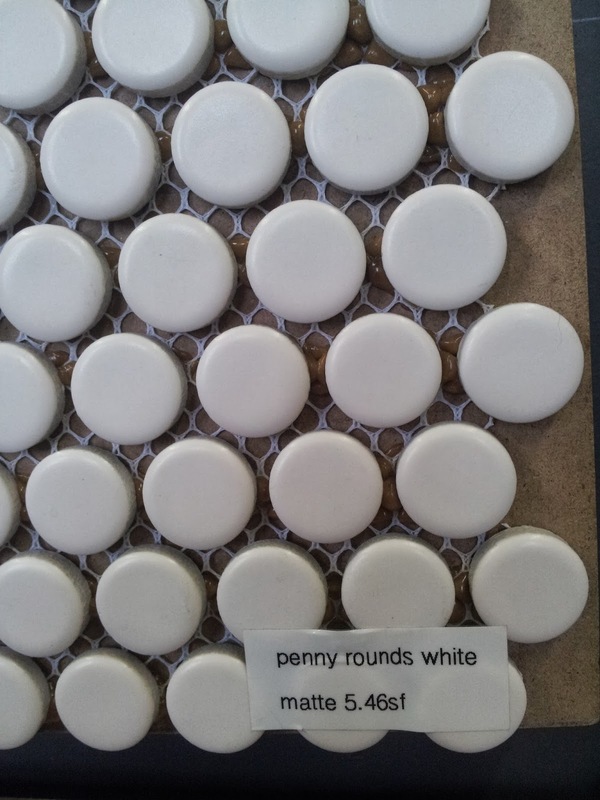 How would it look with the white penny tile? 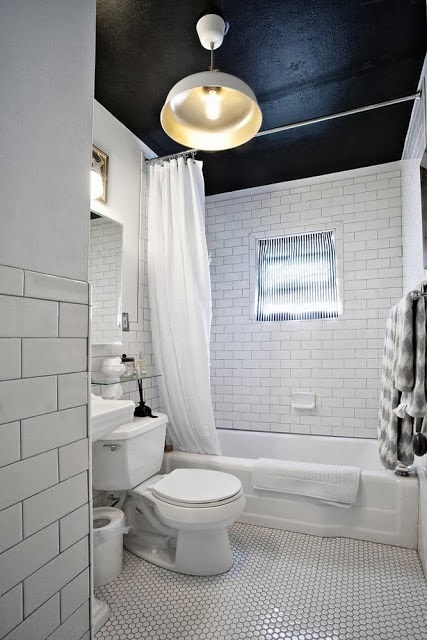 I also kind of like the idea of a black ceiling with an all white bathroom. What do you think of this? For us, the jury's still out. 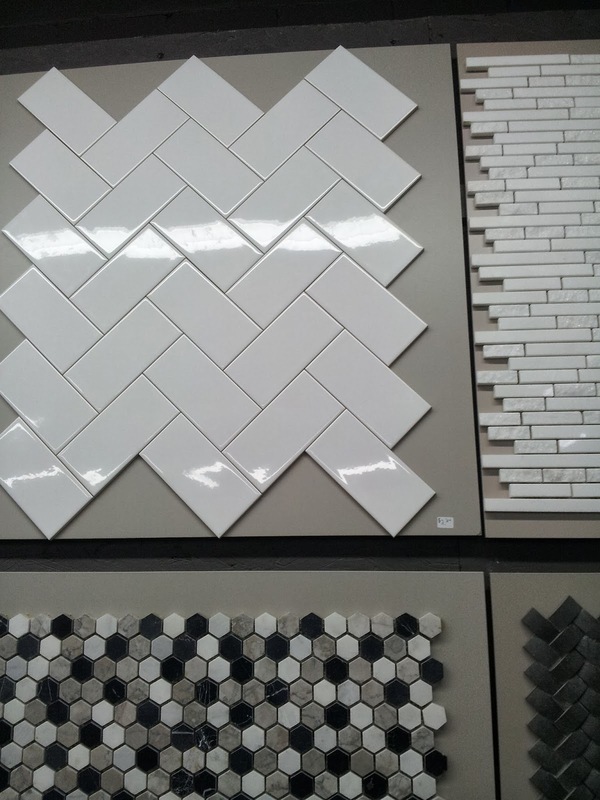 The results of day one of our tile search were promising but still inconclusive. Stay tuned for part two! How You Like Me Now, Grout?